Police have discovered a cannabis farm hidden on an artificial island in northeastern Crimea, it's reported. 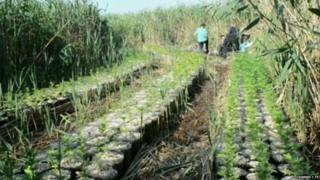 About 500 plants were being cultivated in neat rows, concealed from prying eyes behind the island's tall rushes, Russia's Lenta.ru news website reports. The farm covered 2,000 sq m (21,500 sq ft) of land, and a man found guarding it was detained, according to local police spokeswoman Yelena Alekseyeva. Video footage from the site shows some of the plants were almost as tall as the police officers who found them. But the "cannabis island", as it has been dubbed by Russian media, was trumped a day later when police made another find - more than 1,000 cannabis plants in two more plantations on the shore opposite the island. Preliminary estimates suggest the combined street value of the haul would be around $3.5m (£2.3m), Ms Alekseyeva says. The major operation was uncovered in the Sivash, an area of shallow lagoons on Crimea's northern and eastern coasts. All the plants have now been destroyed, according to the Rossiya 24 news channel.